Operation Alert “Civil Defense Drill” – Federal Civil Defense Agency | We Seek the Truth! In 1954, the United States Federal Civil Defense Agency instituted an exercise called Operation Alert. It was a civil defense drill that took place on the same day in scores of major cities. Citizens in what were called the “target” areas were required to take cover for fifteen minutes. At the same time civil defense officials tested their readiness and their communications systems, and federal officials practiced evacuating from the capital. Even President Eisenhower left the White House for a tent city outside Washington. The following day newspapers routinely published reports of the fictitious attacks naming the number of bombs that were dropped in the mock alerts, the number of cities hit, and the number of casualties. In 1955, New York State made the failure to take cover during an Operation Alert exercise punishable with a fine of up to $500 and a year in jail. A small group of pacifists that included Catholic Worker Dorothy Day reacted to this law by staging a protest in Manhattan’s City Hall Park. When the air raid sirens sounded, on June 15, 1955, the 27 protesters sat on park benches, surrounded by reporters. They explained that they were protesting the government’s pretense that citizens could be protected in the event of a full-scale nuclear attack. The protesters were arrested and given suspended sentences. There was one more Operation Alert in 1961. The young mothers managed to bring together two-and-a-half-thousand protesters. That year civil defense protests also took place in other states, and hundreds of college students staged demonstrations on several East Coast campuses. 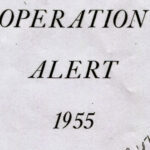 In 1962 Operation Alert was permanently canceled. Operation Alert – FBI Release [67 Pages, 43.1MB ] – When I first filed the request to the FBI for records pertaining to Operation Alert, the FBI denied any documents existed, and gave me a “no records” response. I then found reference in another FOIA Case File that multiple documents had been released, so I filed a new request citing this FOIA case, the subsequent release of documents, and requested a new search. I received this in the mail, and I was also informed that there may be additional records. I filed to obtain these records, and am awaiting a response. The post Operation Alert “Civil Defense Drill” – Federal Civil Defense Agency appeared first on The Black Vault.